This Wednesday we are giving you the opportunity to get one of our Spring products completely free when you buy one in store. 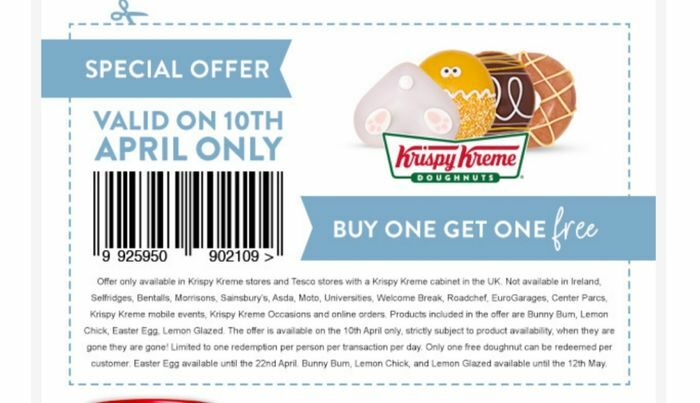 This offer is available in Krispy Kreme stores and Tesco on Wednesday 10th April only *Terms and conditions apply. Simply go into store with your card or this email to redeem this offer. If you would prefer to redeem this in Tesco please print this coupon to redeem at Tesco. Coupons shown on mobiles will not be accepted. What do you think of this Krispykreme deal?